Heat oven to 375 degrees F. Coat a loaf pan with cooking spray and lightly dust with flour. Bring dates and water to a boil in a small saucepan over medium heat; cook 2 minutes, or until dates are softened. In a medium mixing bowl, sift together flour, cocoa powder, baking powder, baking soda and salt. In a large mixing bowl, using a mixer on medium speed, beat almond butter, raspberry preserves and date mixture for 1 minute or until well combined. Beat in egg and vanilla until combined. Reduce mixer speed to low and gradually beat in flour mixture alternating with buttermilk until just combined. Stir together an additional tablespoon of flour and raspberries until well coated; stir raspberries into batter along with chocolate chips. 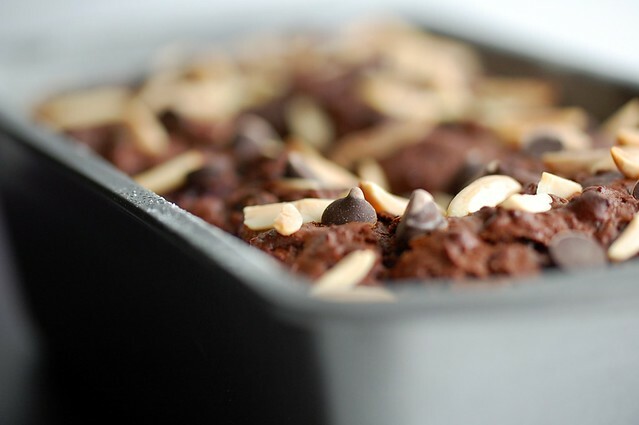 Smooth batter into pan; sprinkle with almonds and a few extra chocolate chips if desired. Bake 40-45 minutes or until well risen, fragrant, and golden brown around edges. Cool on a wire rack before slicing. 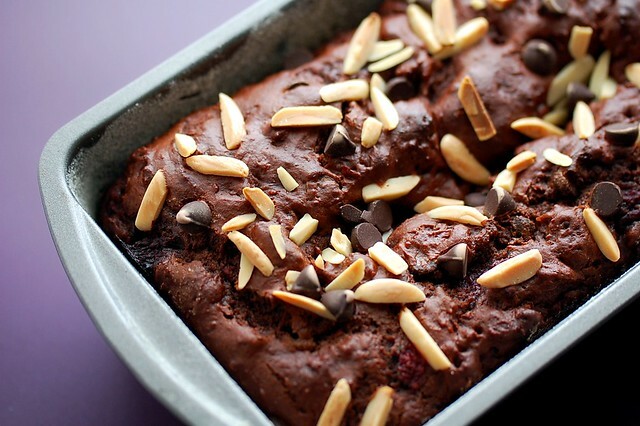 47 comments on "Raspberry Almond Truffle Bread"
Uh you had us at truffle. This bread is gorgeous! Given that I and all my classmates live right across the street from school...yeah we get no snow days. I think I need to make this bread just to make myself feel better about that fact! What an amazing bread...dessert? Look at that snow! Emily, I thonk I fell in love with this bread. Plus, it's easy to prepare it with Nutella instead of the almond and chocolate spread (wich I don't think that exists here). I made my own almonds and chocolate spread last week and I really that I will make your bread! This week-end! Wow.. this bread wouldn't last the night in my house. It sounds unbelievably delicious! Awesome creation! Such a gorgeous colored bread, glad you get the day off. Yum, you had me at raspberry + chocolate. Keep 'em coming. :) Glad you're surviving the snow! truffle bread..I like the sound of that! Tons of snow here as well! I'm pretty sure I won't be able to stop thinking about this bread until I make it - it looks simply divine! I'm all about healthy baked goods that taste indulgent, so this truffle bread is juuuust my cup of tea :). Now I just have to decide whether to make this bread or your amazing-looking carrot cake this weekend. Perhaps both? ;). 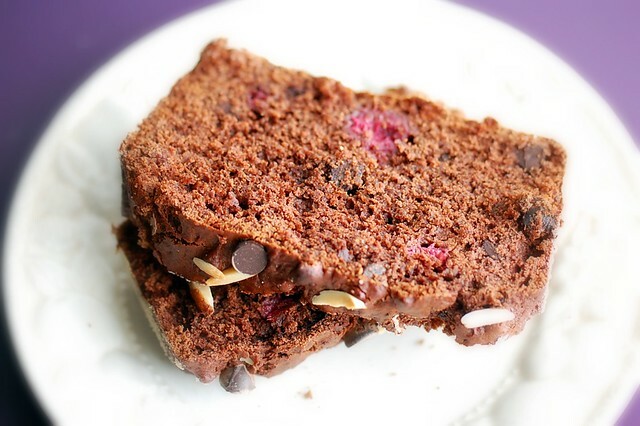 Seriously, chocolate and raspberries have got to be the most delicious combo. well, besides bananas and chocolate, or penaut butter and chocolate, etc. I got carried away. Nice recipe!! Oh my gosh, this looks so good! I love the combination of raspberries and chocolate! Glad you were able to get off work! It's crazy out there! We got about 20 inches, and then drifting as high as about 3 1/2 feet! Oh my does this look good! I unfortunately haven't had any snow days off despite mass amounts of snow so this bread looks like the perfect treat! Oh, my... this bread sounds so delicious, I want to cry. I will definitely have to try it! We were predicted to get 16-18"" of snow from the storm, but we only got around 4-5" - lame! 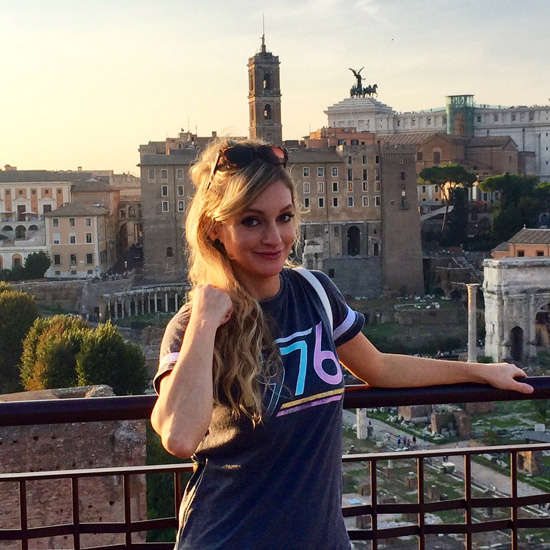 It's nice to have a few days off, but think how nice that would be if it were sunny and 80 degrees! That gorgeous bread would certainly help to make this horrible weather bearable, though. I don't really like peanut butter, but I can get into this chocolate almond butter! The loaf looks delicious, and the snow is ridiculous. Maggie, I'm so glad you liked it! Kim, that's a good idea! I think I might even prefer Nutella. Sally, you should post before and after pictures. We got crazy snow over here too. Snowed in for 2 days. Gross. I wish I had some of this bread to keep me company though. Chocolate- Almond Butter?? That's gotta be a lot like Nutella, right? I'm in! yummy this bread looks good. Pity I don t find the almond butter here. oh my, love this bread! perfect for a sweet treat after dinner i'm sure ;) i need some true winter boots... i just keep putting it off!! I really like the look of this bread, but I really can't stand respberries. Don't know what it is about them, but they really gross me out. Do you think blueberries would work? Or strawberries? Blackberries? Nutella should work too, right? 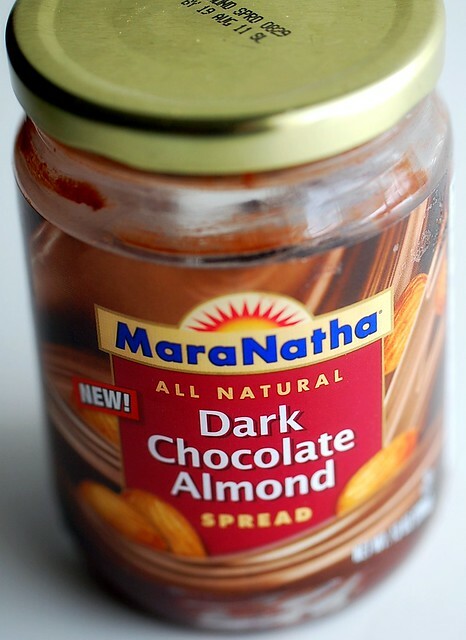 I can not wait to try it, though I think I will be trying it with Nutella instead of the almond butter. It seems like the most perfect blizzard bread ever! Incredible photos in this post! You are a very gifted photographer. Isn't all of this snow just lovely? Makes me want to go outside and roll around naked I tell ya (Yes the snow insanity has reached by brain). I'm sure if I had this spread in my house I'd eat the whole jar before I could make the bread, although I think I'd really really really try hard to make the bread first because it looks so good. My local farmers market sells some locally made peanut and nut butters in various flavors. It might be nice to use on in a recipe like this. I am determined to make this bread as soon as possible! I also want to thank you for making some more "healthy" recipes lately! Your bread looks worthy of a snow day :) Great idea to use the almond butter, I love doing it but haven't baked an almond cake in a while...I know what's next! Hmmm - chocolate almond butter! YUM! And this is coming from the girl that "doesn't like chocolate." This bread looks divine Emily! This looks great! I love that there is no added fat and sugar. I am going to make this, you sold me on it! I just have to find the almond stuff. 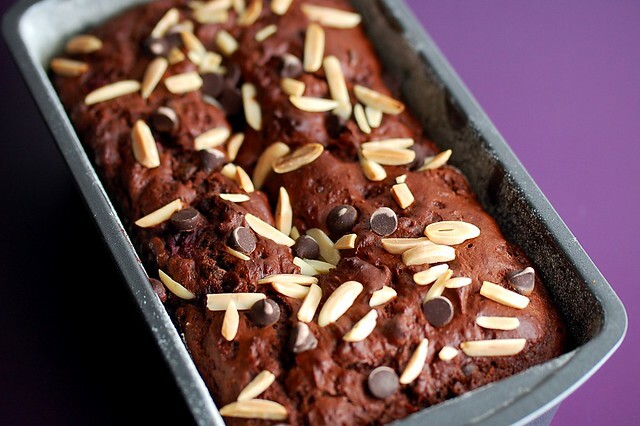 I haven't heard of chocolate almond butter before, but this looks like the perfect way to use it - yum! I love how this doesn't have any added sugar! I have a huge jar of almond butter, do you think I could just add some cocoa powder with the dry ingredients and have it come out okay? This looks absolutely delicious Em - I like the little raspberry "heart" - it's a nice touch. Enjoy being snowed in! You need a bread like this to warm you up with all of that coldness. Chocolate and Truffle.....sounds great, and it looks absolutely sinful! Thanks for sharing, I can't wait to try it. I made this bread yesterday but had to use an organic chocolate hazelnut spread instead of the almond butter since I couldn't remember what store I've seen the almond butter at before. Anyway, it was so delicious! And it was the most moist bread I can remember eating in forever. Thanks for another great recipe. Kelli, yaaay! So glad you liked it! I made this bread using homemade chocolate almond butter and it turned out divine! I made this bread again after I found the chocolate almond butter. I took it to a breakfast event and got three requests for the recipe. SO delish!